Beautiful and unique chess pieces. Carved perfectly by expert craftsman and polished in beautiful color. Nice yellow with glossy touch, looks so elegant and interesting. Simple but attractive chess pieces make it perfect also for house decoration. 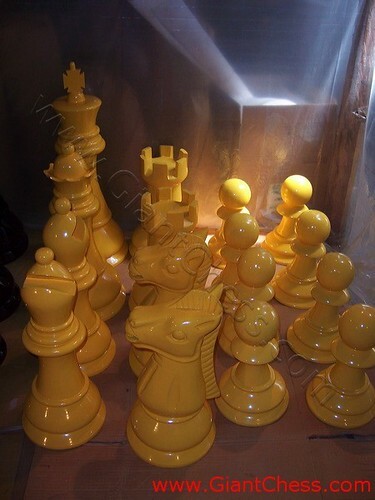 Your living room will be looks nice if you put this kind of chess pieces. Those are sized 24 inch, so they aren't too small and not too large. For other use, you can having outdoor chess game with your friends and family. Our 24" chess set is very popular for outdoor use, on a board with 12" x 12" squares. Children and adolescents especially love these pieces, and they are still not too large, nor too heavy, to be taken with you wherever you should wish to play. Even if kept permanently outdoors, in yard or garden, because they are of teak they can withstand any weather. Those are durable and high quality products.